Passify is a simple password generator. 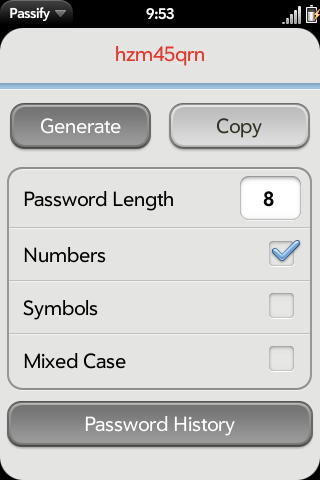 The user can choose to generate a password between 4 and 20 characters in length and can specify whether numbers, symbols, or mixed case should be used. Once a password is generated, it can easily be copied to the webOS clipboard to be used in other applications. Important: Currently, the password history is stored unencrypted. This app should not be used to securely store your password.